Dear friends and customers of the MOTO project. We like to thank you for supporting us throughout the year 2009 and encouraging us with helpful and constructive criticism. Our wish for 2010 is that more of the hotels will buy MOTO products rather than imports to make tourism on the island more sustainable. 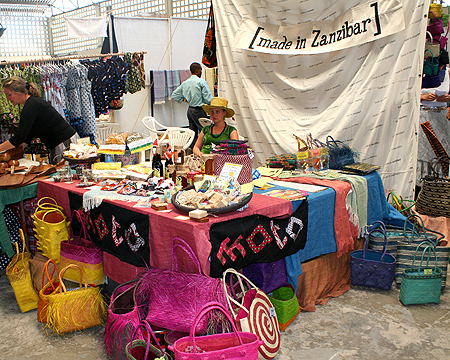 A photo of the beautifully decorated MOTO table at the Made in Zanzibar stand on the Makutano Arts&Crafts Fair, Dar es Salaam. Big thanx to our volunteers. Spice up your excursion to Jozani National Park with a visit to the MOTO Workshop and Ukili Museum in Pete. Learn to design and batik your own t-shirt, sheet or table cloth, have a go at weaving on a wooden loom, or plait a strip of ukili and finish the afternoon with a delicious traditional Zanzibar lunch. Families, groups and school classes are welcome. Please make your booking! After the monkeys – creative relaxation.